Amorgos is a special destination to experience from the sky. Located in the easternmost island of the Greek Cyclades, it is known for its unique monastery – a masterpiece built high in its cliffs. The monastery of Panagia Xozoviotissa leaves its visitors in awe. 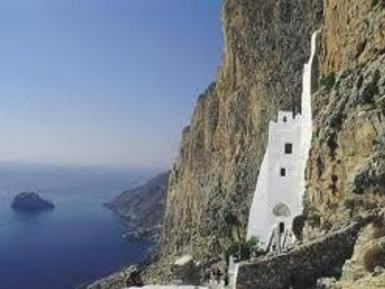 It’s bright, white exterior contrasts beautifully with the surrounding mountain cliffs and the blue of the Aegean Sea. The whitewashed wonder is vertically tucked into the craggy walls of the Profitis Ilias, 300 meters above sea level. Views of this beautiful island and its famous monastery were featured in Luc Besson’s film, The Big Blue. The monastery celebrates its saint day on November 21 but it is widely visited as well during the August celebration in honor of the Virgin Mary. Experience all that Amorgos is famous for right from the sky, including its cliff hugging monastery, its whitewashed villages and its breathtaking rocky landscapes.